Oren Cohn, a student-leader with RIT Ambulance, was honored as EMS Provider of the Year by the National Collegiate EMS Foundation for his service as chief of operations. 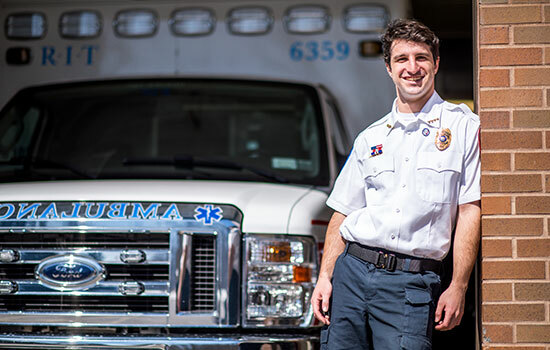 Oren Cohn, an undergraduate at Rochester Institute of Technology, was recently honored as EMS Provider of the Year by the National Collegiate EMS Foundation. Given to one collegiate emergency medical services leader from across the country, Cohn, RIT Ambulance chief of operations, was recognized for his leadership role with the all-volunteer campus ambulance team, providing training and emergency preparation as well as research for the university’s comprehensive active shooter response initiatives. Cohn and RIT Ambulance also received an EMS Ready Campus award for excellence in emergency management and disaster preparedness in addition to recognition from the Sudden Cardiac Arrest Association for several instances of CPR saves on campus over the past academic year. The awards and recognitions were part of the foundation’s recent conference in Philadelphia. “Oren’s combination of devotion to RIT Ambulance and his history of innovations to emergency services made him an outstanding candidate for this award,” said Dr. Wendy Gelbard, associate vice president, Wellness, Student Affairs Division, and medical director of RIT Ambulance. “Through his actions and involvement over the past three and a half years, he has built interdisciplinary connections and demonstrated to the university that RITA is an essential and valuable campus resource. When a fire broke out in Colony Manor student housing at RIT early in the semester, several students needed medical care for smoke inhalation. Those treated may not have realized that members of the ambulance team responding were classmates. The organization is 100 percent student-run, and RIT is one of only a handful of New York state colleges and universities with a dedicated ambulance crew and vehicles that not only go on calls but treat and transport patients to regional hospitals. Other corps have students as part of the campus public safety teams, but providing care and transportation is usually done by the colleges’ public safety professionals. Following in his father’s footsteps, Cohn began as a volunteer fire fighter in his hometown of Bedford Hills, N.Y., when he was 15. When he arrived in 2014, he joined RIT Ambulance and has risen to chief of operations. The fourth-year environmental sustainability, health and safety major manages staff training, oversees equipment purchases and quality management in addition to supervising the extensive personnel certifications required for the 60-plus members of the group that makes an average of 600 calls per year. Cohn also represents the group during planning meetings with members of RIT Risk Management and has a seat on the Town of Henrietta’s Unified Emergency Management unit, established in May 2017 and made up of local ambulance, fire department and other emergency workers. RIT Ambulance is active on and off campus because of their capacity to treat and transport those in need of care to local hospitals, Cohn explained. “This is work that I’ve enjoyed doing for a long time now. And increasing our role in the local community was a big goal of mine this year,” he said. “I worked with our Public Safety department on campus and the community fire department to get all of us together more often, and this resulted in us being better prepared for emergencies on campus. The process to become certified takes between two and three semesters. Many new recruits have never been involved with EMS before, and the strict training ensures that people have knowledge not only of the campus, but of state and country medical protocols and how to care for people, Cohn explained. The group does regular mass casualty drills, working with RIT Public Safety and the Henrietta Fire Department on simulations. “It is an unfortunate occurrence on college campuses, and when we set these up, we base our actions on statistics of past events, and we always act as if we are responding in real life,” he said. As a student, Cohn was part of a National Science Foundation Ignite funded project, Emergency Internet Bypass Lane Protocol, that created technology to improve internet-supported information sharing in incident response and command. The project was a national award winner for networking technology under the U.S. Smart Cities Initiative. And as part of a senior project, Cohn will contribute critical research about emergency planning, including information about an active shooter response, for the ambulance crew that will be part of an overall RIT and larger community plan.